"If our youngsters work according to Swami Vivekananda's thoughts, India will become great world-power. ", Shri Shivarai Kulkarni, a renowned journalist, said when he was talking to the audience on the occasion of Swami Vivekananda Jayanti celebration at Scientific hall, Lakshmi nagar, Nagpur on 13th January, 2015. Swamiji's thoughts will make us forget the differences and unite us to work for the Motherland with great vigour and enthusiasm, he added. Dr. Vilas Deshpande, (H.O.D. - Applied Physics) Vishveswaiya National Institute of Technology, presided over the function. In his presidential address he paid obeisance to Swamiji and threw light on gigantic work done by Ma. Eknathji as a dedicated worker of RSS, creator of Vivekananda Rock Memorial and founder of Vivekananda Kendra. Prizes were also distributed in the programme to the winners of Bharatiya Samskriti Pariksha and Geeta Essay competition. In two categories the Bharatiya Samskriti Pariksha was conducted - 1. College students and 2. Open to all. 300 persons participated in this pariksha. 30 persons wrote essays on Shrimad Bhagawad Geeta. The programme started with Prarthana and ended with Ku. Vande Mataram by Vedavati Kher. A song on Swamiji was presented by Ku. Manasi Deshpande. All the people who were present for the programme liked the short film on Ma. Eknathji. Vivekananda Kendra activities were presented before the audience by Shri Chintan Magia and Shri Vaibhav Joshi. Sau. Gauri Kher, Nagar Pramukh, proposed vote of thanks. Sau. Gitanjali Kelkar and Sau. Gauri Shastri Deshpande conducted the programme. On 12th Jan. a programme was conducted at Ishwar Deshmukh College of Physical Education, Nagpur. Principal of the college Dr. Anil Karwande presided over the function. "Swami Vivekananda has given a very important message of Strength - physical as well as mental. All of us should be ready and alert always for the service of our Motherland." , he said while talking to the students. Shri Lakheswar Chandravanshi, editor of a Hindi weekly Bharatwani deliberated on inspiring story of Vivekananda Rock Memorial and Ma. Eknathji. Shri Roketso Mam and Ku Tanushri Koshal, both students of the college expressed their thoughts on Swamiji. Vivekananda Kendra activities were presented by Shri Shubham Jais and the programme was conducted by Shri Bharat Rai. 30 students attended the programme. In another gathering of 10 Karyakartas on 12th Jan. at Ramnagar Visthar, there was reading and discussion on Swamiji's elevating thoughts. The focus was on internalizing the message of Swamiji and rededicating to the cause. Different competitions like elocution, patriotic songs, Ekatmata stotra chanting and Swamiji's quotations were conducted for Samskar Varga children on 11th Jan, 2015 while celebrating Swami Vivekananda Jayanti at Shivaji hall, Shivaji Nagar, Nagpur. prizes were distributed to the winners. Children enjoyed various interesting games and patriotic songs. A special appreciation and prize was given to the kids - the twins of the age 10 - who saved an 8 year old girl who was sinking in a pond. Their mother feels that they could do this because they attended Samskar Varga and came in contact with Swamiji's thoughts. 40 children from Ram nagar, Trimurti nagar and Pratap nagar vistars with their parents attended the programme. 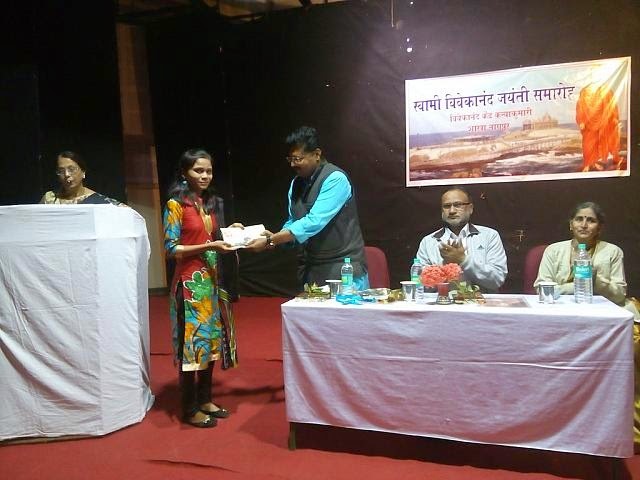 A youth convention was arranged on 11th Jan., 2015 at New English School, Wardha. 85 college students who participated in Bharatiya Samskriti Pariksha attended the convention. There were sessions on Swamiji and Ma. Eknathji's life giving message. Group discussion session was based on these thoughts and a student from each group presented the gist of their discussion. Prizes and certificates were distributed by the Principal of the School, Shri Vyasji and Shri. Borkar. Kendra Karyakartas participated in 5 more programmes arranged by various institutions on 12th January.